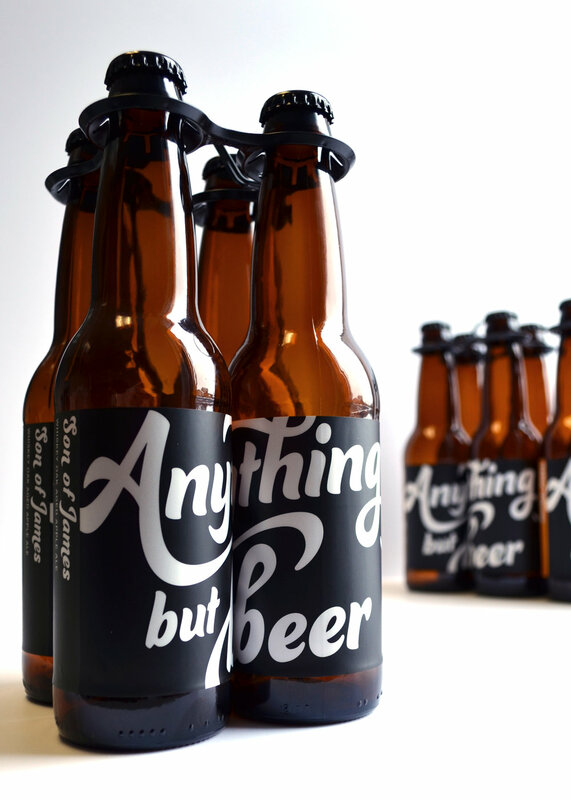 Anything But Beer is a brewery that has grown out of passion for food and beverage, community, and the process of creation. We discovered that many people either dislike the taste of beer or cannot drink it due to dietary restrictions; yet they want to be included in the craft beverage scene. That’s when we set out to create beverages that meet the needs of this underserved group of people. Now we are brewing a wide variety of alcoholic beverages that meet those needs and more. Our products allow a greater number of people to enjoy interesting craft beverages and to feel included by the craft brew community. At Anything But Beer we aim to meet the needs and preferences of niche consumer markets, such as those with dietary restrictions and those who dislike the taste of traditional beers. We take the time to research and understand industry need so that we can develop innovative and exciting products. And we like to have fun with our flavor profiles so we frequently release new things! The current selection of products at Anything But Beer are at the crossroads of ciders, wines, and beers. They meet the flavor preference of those who dislike the taste of traditional beers, but that still enjoy the craft beverage scene. Additionally we run a completely grain free brewery, producing naturally gluten free products with local fruits and vegetables. Some of our most popular are Son of James (Oak Aged Irish Whiskey Apple), Wild Thang (Wild Fermented Cider), and Bay of Bengal (Blueberry Cardamom). Our products can be found on draft and in bottles throughout the Central New York region so be sure to ask your bartender for an Anything But Beer. 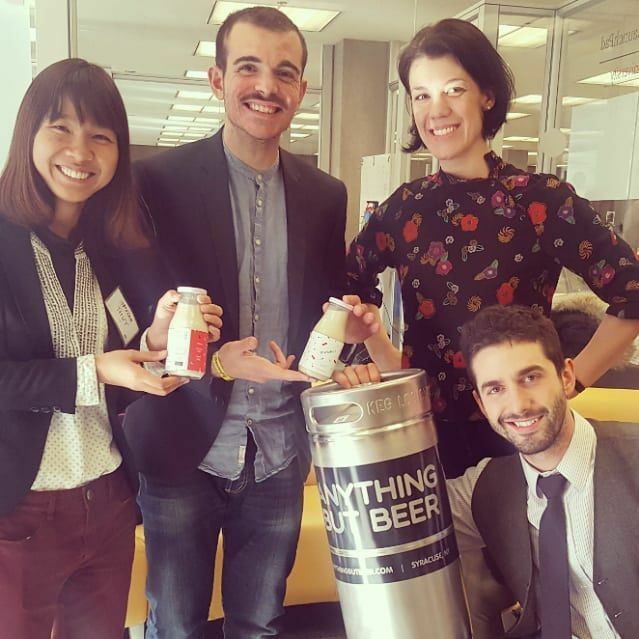 LOGAN BONNEY is a co-founder and the CEO of Anything But Beer. He has been brewing for seven years, creating fruit wines and meads based on ancient recipes, which he learned while a member of a Renaissance festival organization. He has degrees in mechanical technology and business administration, as well as a recent master’s degree in entrepreneurship and emerging enterprises from the Whitman School of Management at Syracuse University. He served in the Air National Guard for eight years, while simultaneously starting his first business, a rental property company in Syracuse, NY, which has been growing steadily for seven years. He brings that experience and growing enthusiasm for business and brewing to Anything But Beer. BRITTANY BERRY is a co-founder and the CMO of Anything But Beer. She has a bachelor’s degree in industrial and interaction design from Syracuse University. She focused her training on user research, strategy, and experience design. Additionally, she has work experience in sales management, operations management, and design consultation. She is passionate about using her varied skill set to build something that positively impacts the industry and the community. Team Anything But Beer loves connecting with people and that is the greatest thing this business has provided for us! Our supporters during the planning and building phases, our fellow brewers, other local business owners, and our passionate following, we are so grateful to have met every single one of them! We are excited to see how our communities continue to grow thanks to all the amazing people who make magic happen! If you also love connecting, join us at any of the various events we participate in each week (see our Events Page) or reach out anytime. We are always happy to make connections, give referrals, share our experiences, and hear what others are all about. Cheers!